In designing his industrial works, Clergue sought to make a resounding impression with potential investors. The size of each factory matched the largest in North America, but their facades were arguably more impressive than their output. 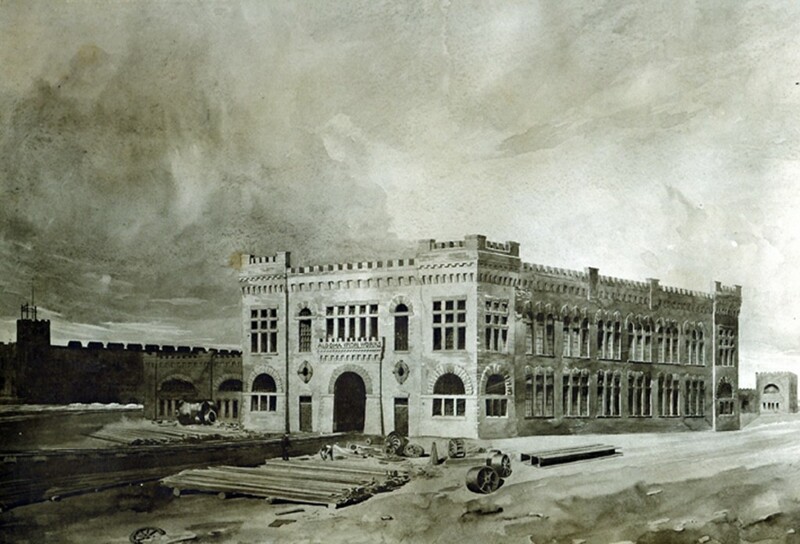 Mid 19th century North American architecture took inspiration from medieval styles. Gothic and Romanesque styles experienced a strong revival. Churches, public buildings, schools and factories everywhere were built to resemble Europe’s castles and cathedrals. Clergue’s Sault structures were part of this revival. They are most comparable to the Romanesque revival made famous by New England architect H.H. Richardson. 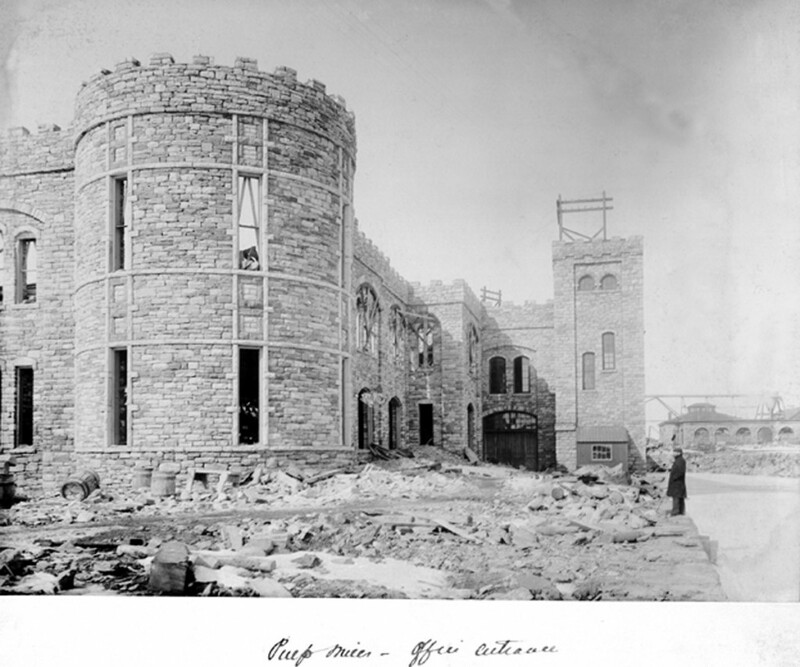 The multitude of rounded arches, towers, turrets, and portals on display across the Sault works were inspired by Richardson’s Romanesque style. These Sault structures are not mere clones of Richardson’s work. These buildings share his inspiration, yet retain a unique style. The architect responsible for Clergue’s works remains mysterious. There is no question that Francis Head was responsible for many Clergue building designs. An Irish architect who moved to Canada in 1879, Head began his career in Manitoba and soon moved to Rat Portage (modern day Kenora), where he constructed hotels, schools, and residences. It was not until 1899 that he moved to Sault Ste. Marie to become Clergue’s chief architect. Head was directly responsible for designing the Sulphite Pulp Mill 1899-1901; the Main Administrative Building; and the Algoma Iron Works Block (Machine Shop). Of the surviving buildings, the Pulp Tower, Administrative Building and Machine Shop are by far the most prominent. Head is thus a very important figure in the Sault’s architectural heritage. There are problems in fully attributing the site’s design character to Head. 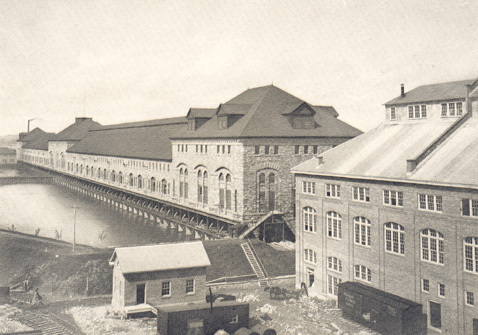 On his 1899 arrival, the power plant and the first pulp mill had already been constructed. 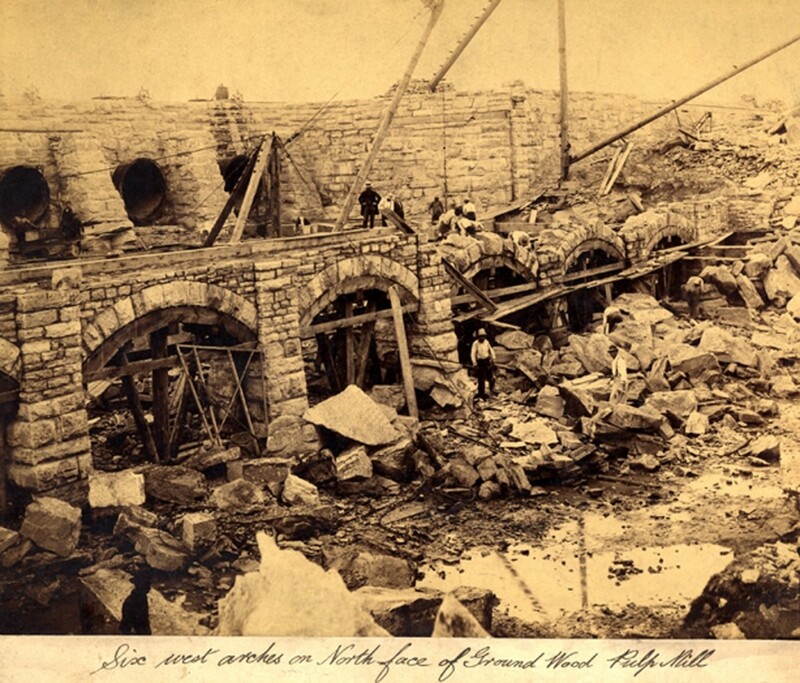 These structures are no longer standing, but their character was clearly Romanesque inspired. Head’s structures were clearly designed to be stylistically coherent with the existing buildings. James Calloway Teague possibly played a role in the buildings’ design. Prior to his Sault arrival Teague constructed the Manassas, Virginia courthouse with several Romanesque features. Teague designed Clergue’s enormous power plant on the American side of the St. Mary’s. This plant shares the Romanesque character of the Canadian structures and is the largest of the surviving Clergue buildings. Teague was trusted with building the grand Montfermier mansion in 1902. Construction on the Michigan power canal began in 1898, placing Teague in the Sault before Head. 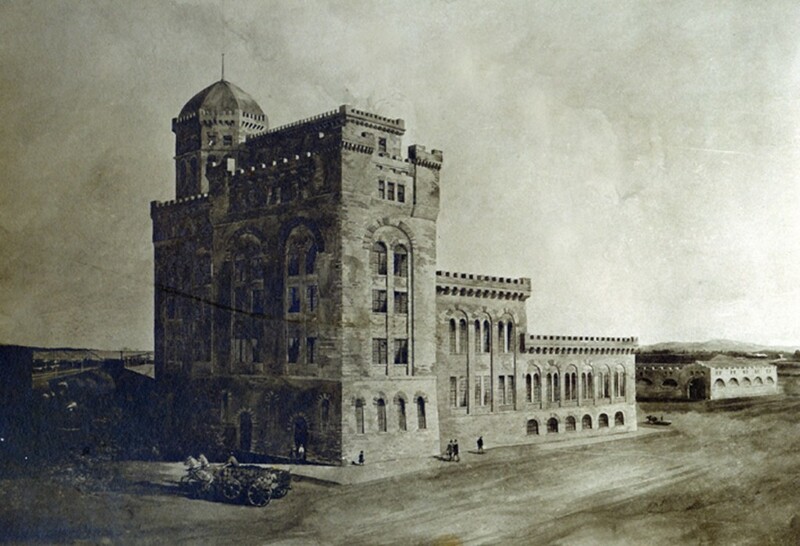 However, this Michigan construction commenced three years after the construction of the first Clergue power plant, one that unquestionably established the architectural style for the entire site. Whoever designed the first power plant deserves significant credit for inspiring the Sault’s most prominent architectural landmarks. Given the Sault industrial development timeline, it would seem unlikely that Head followed a master plan created by an original architect. The Machine Shop and Pulp Tower designs with their unmistakable castle appearance appear to be derived from a previous architect’s style. The administrative building interior, now the Algoma Conservatory of Music, is still largely original. The structure is built on an original construction of Carnegie steel beams and Sault sandstone. Complete with numerous walk-in safes dating from 1900, oak paneled walls, wonderfully high ceilings, and stained glass, this building retains the dignified nature of an impressive corporate headquarters. The interior was refinished in the 1980s. Where Clergue maintained his private office on the East side of the building, a beautiful and tremendously informative artifact remains. Painted in 1901, a wall sized map illustrates the extent of Clergue’s industrial empire at its very peak. Railway lines, waterways and important industrial centers are pictured. Particularly prominent are the swathes of land from which Clergue planned to extract the natural resources to fuel his Sault industries.